In collaboration with the Rockfall Foundation, local boutique Cinder + Salt hosted an environmentally based forum with State Representative Matt Lesser on April 20. The event, entitled “Green Drinks with Matt Lesser,” was part of a larger series of similar events hosted by the Rockfall Foundation that happen each month. 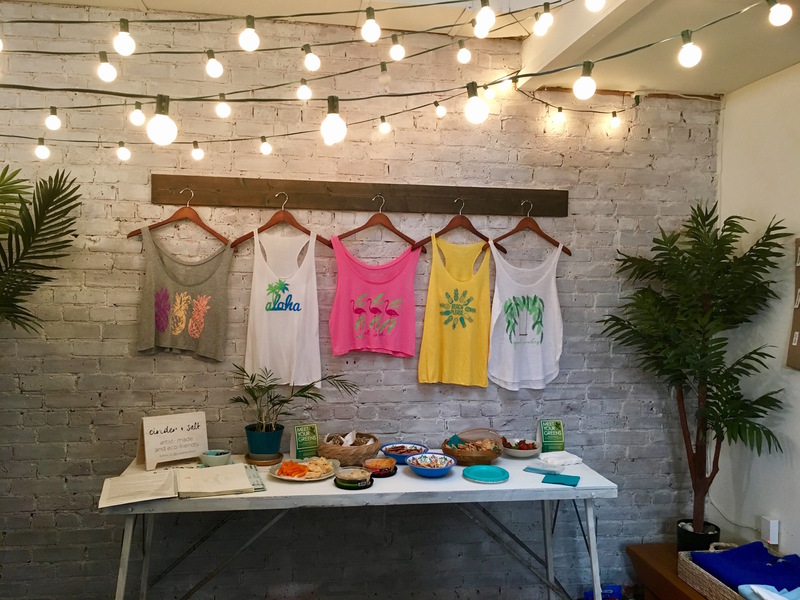 DeCavage, a self-confessed tree hugger and frequent attendee of Green Drinks events, said she reached out to the Middletown chapter of the organization and offered to host that month’s event in her boutique, which is in itself a work of environmentally aware art. The paper palm fronds that line the walls of her shop are made from recycled magazines covered in green paint. 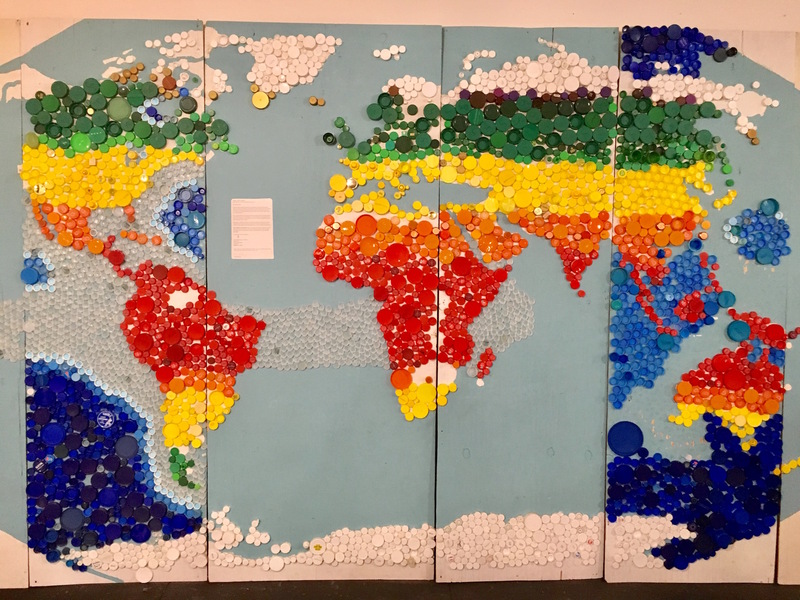 On the back wall is DeCavage’s work-in-progress masterpiece, a map of the world made entirely from recycled bottlecaps of every size and shade, which she compared to over-sized confetti. While DeCavage’s clothes are made from natural fibers ranging from organic cotton to hemp, they aren’t your typical eco-friendly attire. Her shirts are covered with bright, graphic designs, for example a row of pink flamingos or a bunch of pineapples clustered around the phrase “beach, please.” Her goal is to provide clothes for young people who understand that fashion and environmental consciousness aren’t mutually-exclusive concepts. DeCavage’s passion is shared by the members of the Rockfall foundation, who helped her host the event, as they do with all Green Drinks events in Middletown. Andreoli mentioned that in addition to hosting Meet Your Greens events, the Rockfall Foundation offers grants for environmental projects in the region as well as awards for environmentalism and eco-leadership. They are also committed to owning and maintaining the historic deKoven House, located at 27 Washington Street in downtown Middletown. The Meet Your Greens event at Cinder + Salt will be followed by a number of events this summer. The variety of events corresponds with the casual nature of the Green Drinks organization, which provides an avenue for environmentally conscious individuals to mingle and talk about issues pertaining to the environment. There are chapters all over the world, including one in nearly every state in the United States. While they’re geared specifically for individuals interested in the environment, their events generally lack an agenda and are always open to the public. Andreoli noted that she was particularly excited for this event. “It’s a beautiful day, it’s a wonderful turnout, and we’re lucky to have our state representative here to speak,” she said. Following a brief statement about the foundation, Rockfall Associate Director Tony Marino introduced Lesser, who spoke in great detail about the multitude of environmental bills being discussed in the State Senate, including a bottle bill that would make it easier to incorporate plastic bottles into single-stream recycling and a bill to protect snapping turtles. He also discussed a bill that would offer a bailout to the Millstone Power Plant in Waterford, which claims its profits have dropped substantially, profits that they refuse to disclose. As the plant is a major source of jobs in the Waterford area, the region’s representatives, notably Paul Formica, are fighting hard for a bailout bill. After answering several questions at the end of his talk and receiving a roomful of applause, Lesser invited everyone to mingle, shop, and enjoy a drink courtesy of Cinder + Salt.